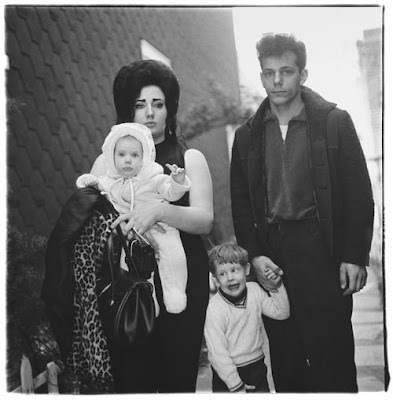 If yesterday the Nazi authorities were seeking to exterminate difference (at the Museum of the Topography of Terror), today at the Martin Gropius Bau, the extraordinarily gifted American photographer, Diane Arbus, was celebrating it. Many of the categories of people the Nazis singled out as deserving eradication emerge in Arbus' photographs as unique individuals, valued, and shown as they are, without either idealism or condescension. As here a Brooklyn family going out for a Sunday outing where the eldest child has a learning disability. A family that suffers together and yet are bound to each other in love and care and off to see one set of their parents. The difference was striking - here, in Arbus' work, were the learning disabled, the dwarf, the Gypsy circus entertainer, the transvestite, the homosexual, the Jew, all of whom were regarded by the Nazis as not of 'the Volk' and as 'degenerates' not deserving of place or indeed of life. Place and life is what Arbus helped give them. The difference, in part, was in Arbus' veneration for the secret - every person carried within themselves mystery and that uniqueness was deserving of celebration, and indeed I am tempted to say, the blessing of being recorded and shown forth. It is a remarkable body of work and one that was commissioned and shown by a remarkable diversity of journals, some of which you might usually associate with lighter or more fashionable fare. Popular culture in the 50s and 60s, I suspect, was deeper, broader and simply more intelligent than now! It is a sadness that her extraordinary vocation did not, it appears, liberate her from her own shadow and she ended her own life in suicide. She did give life and memory to a remarkable diversity of folk, showing that humanity is seen through its diversity not its conformity.